Miracle Shilohs | Welcome to Miracle Shilohs! 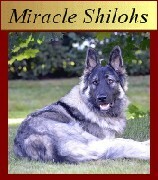 Beware of backyard breeders selling unregistered Shiloh Shepherds, from parents who have not been health tested and who are not registered as breedable, "just for pets." There are many unscrupulous people out there who care nothing about improving this breed, or maintaining health and temperament, and only want to make money. When considering a puppy, don't hesitate to ask the breeder for copies of health clearances, DNA, and registration paperwork for the sire and dam. It is your right to be provided with this information! Select the above link to access a printable copy of our Puppy Application Form. You can also access the form via a link on the How We Do Things page. We proudly register our Shilohs and puppies with the WSSBA. Click on the above logo to learn more about our Registry! Go! dog food! Click on the bag for more about him! Please Send Us An Email if you have questions about this site. Web Design, Content and Photos Copyright �2001-2019 Miracle Shilohs. Photos are not to be used without written permission. All rights reserved.